JUNE 3. 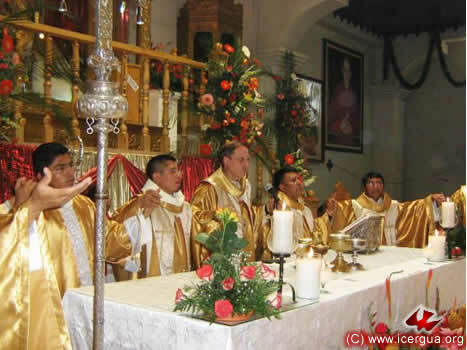 CONSECRATION OF THE SHRINE OF THE MOST SACRAMENT IN COMALAPA. 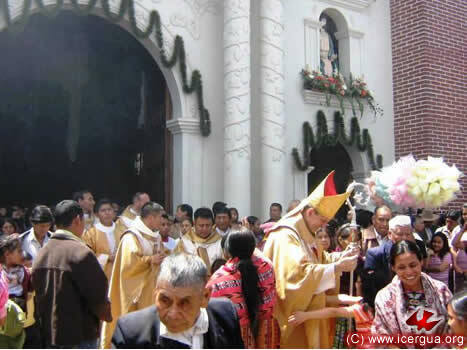 On the Thursday of Corpus Christi, June 3, our bishop celebrated the solemn dedication or consecration of the church of the Most Holy Sacrament, just recently built, adjacent to the Cathedral of San Juan Comalapa. In the same ceremony the decree elevating it to a sanctuary was promulgated. The reason for this ceremony was the request made by the parish organizations and the history that the former Chapel of the Most Holy Sacrament had until it was torn down to make room for new construction. The Holy Sacrament being solemnly on view every day from five in the morning until nine at night and there being a steady flow of adorers, this Sanctuary has been the heart of the parish as a whole. Right: Two angels, sculpted in the colonial period, have been placed above the Sanctuary door to guard the church. Tens of hundreds of parishioners were at the ceremony. They were joyous because of the ceremony and because the recognition of the church as a sanctuary and its consecration was a response to the sense of faith of all the People of God. Following the singing of the Litany of the Saints, the crucial moment of the ceremony was the anointing of the upper part of the altar with the Holy Chrism and the prayer of consecration. The ceremony followed the Renewed Catholic ritual. 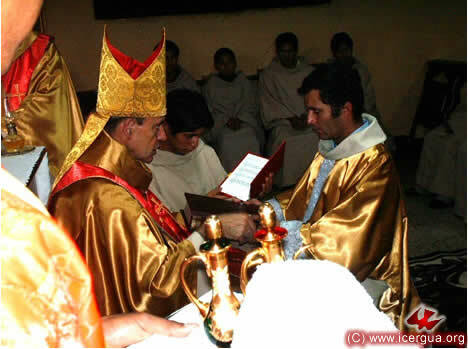 Right: Fathers Rigoberto and Francisco, who are in charge of the pastoral work of the Cathedral, carrying out the rite of anointing while Monsignor Eduardo recites the prayer of consecration. After the altar stone and the four bronze crosses placed on the sanctuary walls were anointed, the burning of fragrances above the altar and the prayer prescribed in the rite served as external indications that the prayers of the People of God rose to the throne of the Lord on High. The view of the Sanctuary is impressive. 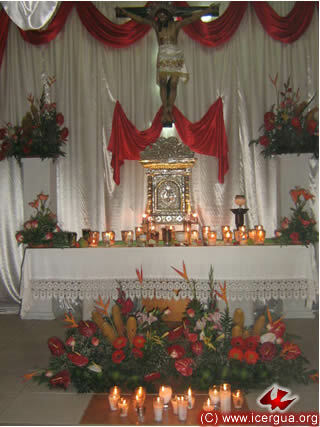 The tabernacle is a true work of art, made of silver encrusted with gold and colonial-period objects. At the end of the ceremony, Monsignor Eduardo shared with some of the directors of the People of God the gratitude due them for the dedication and devotion with which they have carried out the work entrusted to them by the People. JUNE 4. 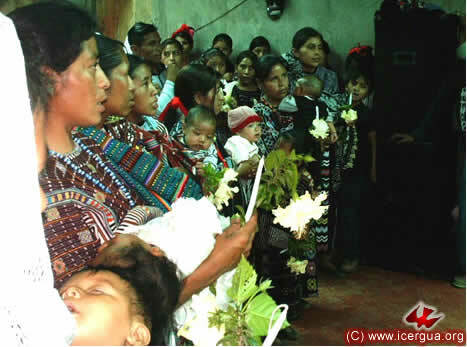 EUCHARIST WITH THE COMMUNITY OF XOLBÉ, SOLOLÁ. 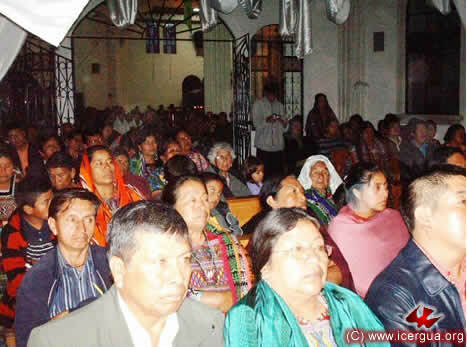 On Friday, June 4, the bishop celebrated Eucharist in the Community of Xolbé, Sololá. Along the highway leading to it could be seen the destruction wrought by the recent storm that lashed Guatemala. We feel grateful to the Lord because in spite of the material damages, not one life of the faithful was lost. JUNE 5. 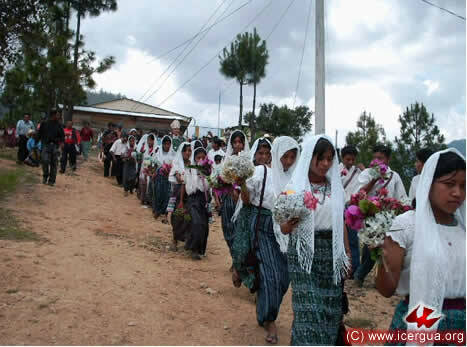 ALLIANCE AND CELEBRATION WITH THE COMMUNITY OF ICAL, COLOTENANGO, HUEHUETENANGO. On Saturday morning, June 5, our bishop visited for the first time the Ical Community in the municipality of Colotenango, Huehuetenango. This community has recently entered the Communion, following a long journey in a search for pastoral care and an understanding of its hopes and the gifts it has received from the Lord. During the Eucharist many baptisms were celebrated. Above: The People of God at prayer when the Holy Spirit is invoked for the pardon of sins. JUNE 5. 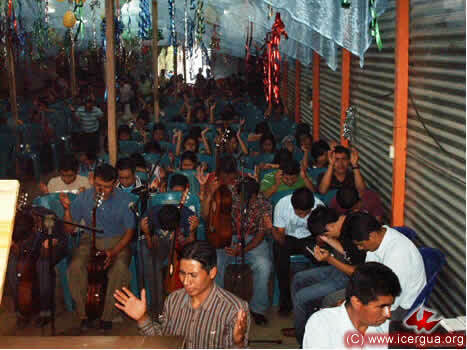 GRAND CELEBRATION WITH THE COMMUNITY OF CHAMUL CONCEPCIÓN TUTUAPA, SAN MARCOS. 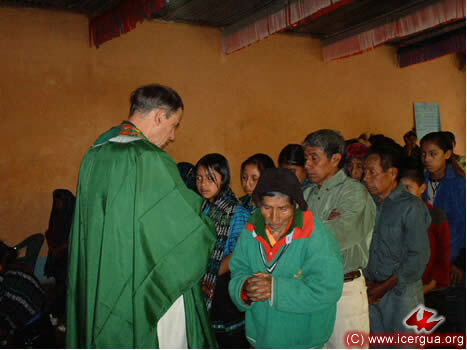 On the afternoon of June 5, our bishop made a second visit to the Community of Chamul, Concepción Tutuapa, San Marcos. This community is very large and enthusiastic. 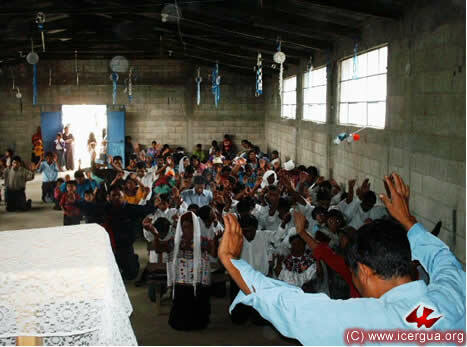 It entered the Communion only at the end of last year, and already the commitment of its members has made it grow and spread the Good News to many of the neighboring villages. Above: Procession from the House of Prayer to the Community Hall, where the Eucharist was celebrated. Right: The invocation of Holy Spirit, asking for forgiveness of sins. 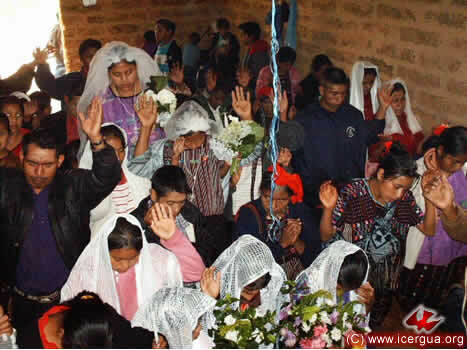 During the celebration of the Eucharist, several baptisms were celebrated, about thirty young people were confirmed, having been carefully prepared, another group received First Communion, and one couple was married. JUNE 6. 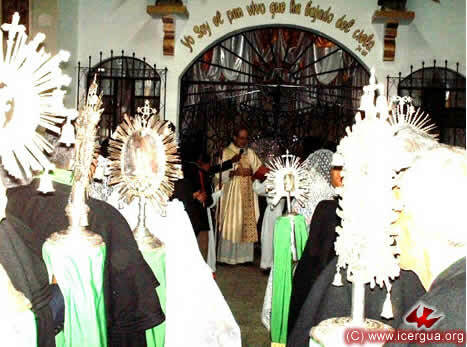 FIRST COMMUNIONS AND CORPUS CHRISTI PROCESSION IN SAN PEDRO SOLOMA, HUEHUETENANGO. 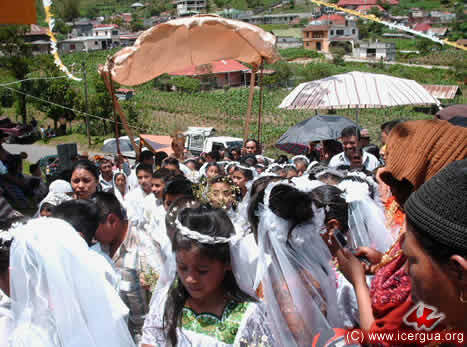 On June 6, the day on which the church celebrated the feast of Corpus Christi, about ninety children of the municipality of Soloma, Huehuetenango, made their First Communion. The careful preparation that the children had received was evident. At the end of the celebration a long procession with the Most Holy Sacrament made its way through the streets of the town. In the ceremony more than a thousand faithful participated and stayed until the end of the procession. Right: The homily. The children are listening intently while our bishop talks to them. For the procession little chapels had been prepared in various places on the route. The participation of the People was full of joy and devotion. The first ones in the procession were the children who had made their solemn communion. Our bishop followed them, raising the most Holy Sacrament. The rest of the people followed. JUNE 12. 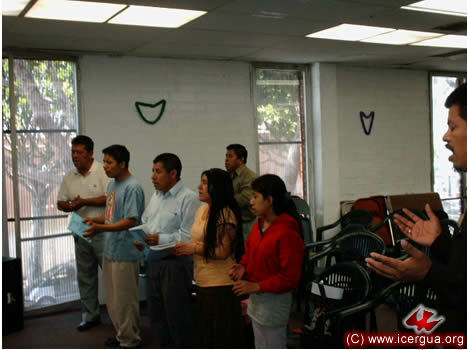 CELEBRATION OF MARRIAGE IN THE PARISH OF SAN MIGUEL ARCÁNGEL, LOS ANGELES. 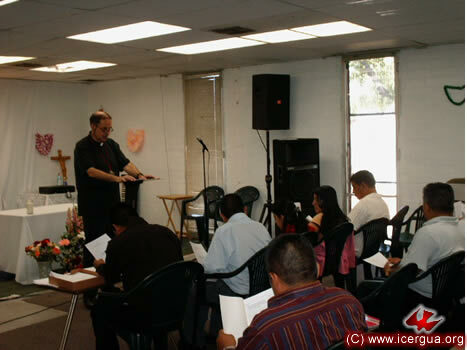 On Saturday and Sunday, June 12 and 13, our bishop made a visit to the communities of Los Angeles, California. 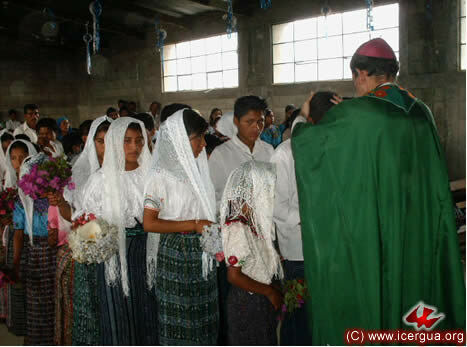 In the Mass that he celebrated with the Pacto Divino Community, the marriage of Pedro and Ana took place. Pedro is the Communion Minister of that Community. Ana is the daughter of the León and Eulalia, directors of the El Pescador Community. 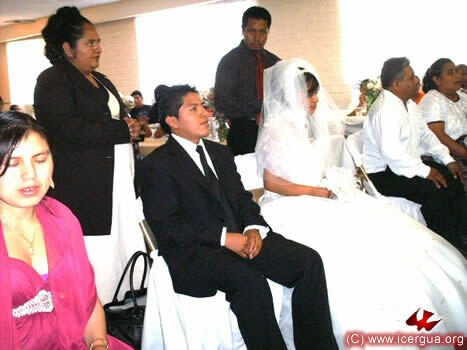 Above: Pedro and Ana are listening intently to the bishop’s homily. 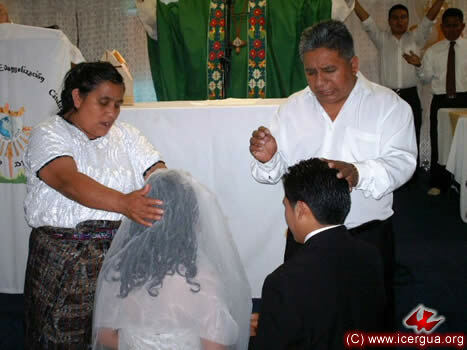 Right: After the wedding, brother León and Sister Eulalia, Ana’s parents, pray over the newly weds and give their blessing. JUNE 12. 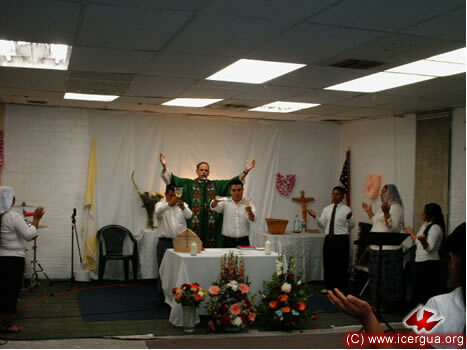 EUCHARIST WITH THE EL PESCADOR MINISTRY, LOS ANGELES. 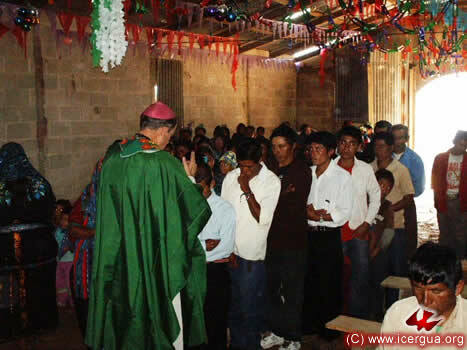 During the evening of June 12, the bishop celebrated Eucharist with the El Pescador Community. Well organized, this community continues to grow, and at present is planning to look for another location that would permit it to give better care to its members and maintain the growth with which the Lord has blessed it recently. Above: The absolution of sins for members of the Music Ministry. Right: The Communion Ministers present the gifts during the offertory. JUNE 13. PROGRESS OF ESTYMLA IN LOS ANGELES. Above and right: Two views of the classes. They last from 9:00 am to 1:00 pm, and are given once a month on Sundays during the bishop’s visit. When the classes end, as can be seen in the photograph at left, the bishop celebrates the Eucharist with the participants. In this way the growth in theological knowledge goes hand in hand with spiritual strengthening. JUNE 18. 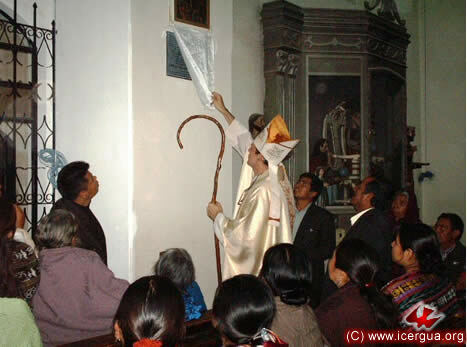 EUCHARIST IN PAJOMEL AND CHUITZANCHAJ, SANTA CRUZ LA LAGUNA, SOLOLÁ. 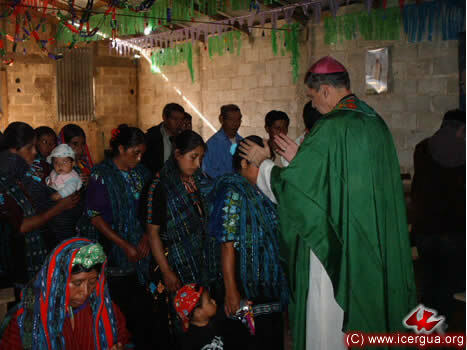 On June 18, en route from Huehuetenango, the bishop celebrated the monthly Eucharist with the communities on the upper part of Lake Atitlán. They are Pajomel and Chuitzanchaj. 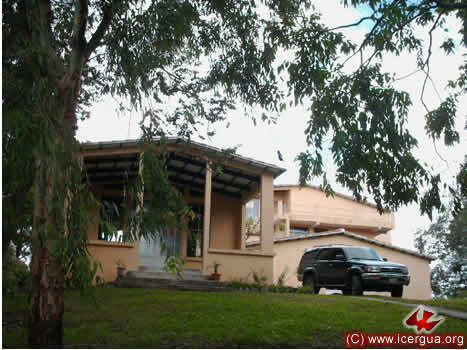 Both belong to the Municipality of Santa Cruz La Laguna, Sololá. They are working enthusiastically and experiencing many blessings. In almost every visit there is the heartwarming surprise that one or two families have joined the community. Above: Eucharist with the Pajomel Community. The faithful are coming forward to receive Holy Communion. 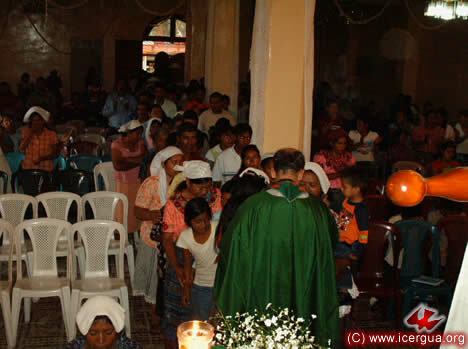 Left: The faithful of the Chuitzanchaj Community, having humbly confessed their sins are coming forward to be absolved. 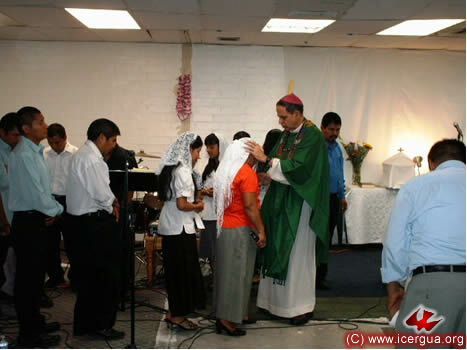 Right: Absolution of sins in the Chuitzanchaj Community. JUNE 19. VISIT TO THE COMMUNITY OF SAN ISIDRO, LA DEMOCRACIA, HUEHUETENANGO. On Saturday, June 19, our bishop began his pastoral circuit by visiting for the first time the small community of San Isidro in the municipality of La Democracia, Huehuetenango. Among other activities was the joyous celebration of marriage between Juan and Carmelina. They have lived together many years, but had not been able to regularize their relation, first because Juan had previously been married canonically and second because they did not have the financial resources to pay for the civil ceremony. After long study the canonical marriage was nullified. With the kind help of a notary on June 19 they were able to celebrate the civil as well as the religious ceremony. In this way they were able to participate in the full range of blessings. Above: Juan and Carmelina, having exchanged rings, exchange matrimonial coins. Right: Two of the leaders of the community pray over the new couple after the end of the liturgy. JUNE 19. VISIT TO THE SAN JOSÉ IXCUNÉN, LA DEMOCRACIA, HUEHUETENANGO. 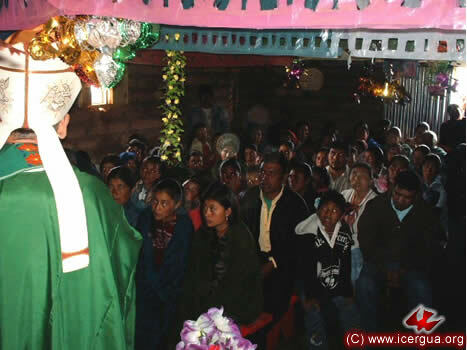 At midday the bishop made a pastoral visit to the Community of San José Ixcunén, which is also in the municipality of La Democracia. This community entered the Communion less than a year ago. It consists of about sixty families, all of them quite large. On the occasion of the visit, baptisms and First Communions were celebrated. Above: The community during the homily. Right: The pouring of water and laying on of hands during the baptism, symbolizing the outpouring of the Holy Spirit that is given by the Holy Trinity when the sacrament is administered. JUNE 19. VISIT TO LA VEGA, LA DEMOCRACIA, HUEHUETENANGO. 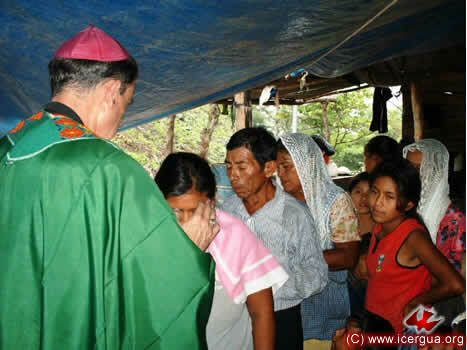 In the afternoon, the bishop visited the la Vega Community, also in La Democracia. This community has a beautiful church. 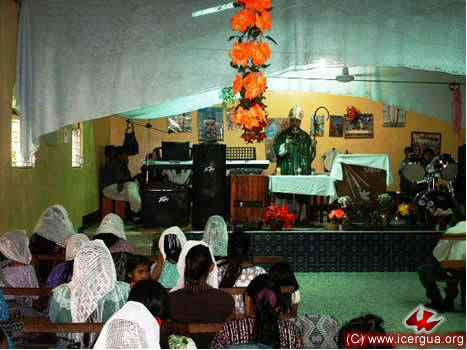 Well organized, it is working actively in fulfilling its Christian and missionary commitments. 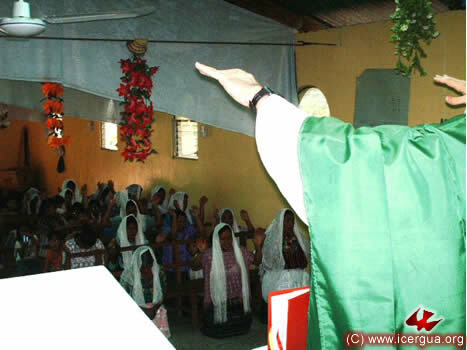 Above: Monsignor Eduardo invoking the outpouring of the Holy Spirit upon the community. JUNE 20. 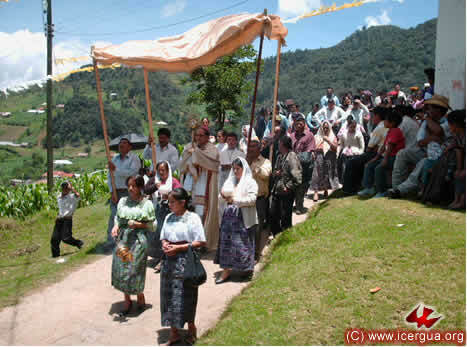 EUCHARIST IN THE COMMUNITY OF SIBILÁ-SAN PABLO, CHIANTLA, HUEHUETENANGO. 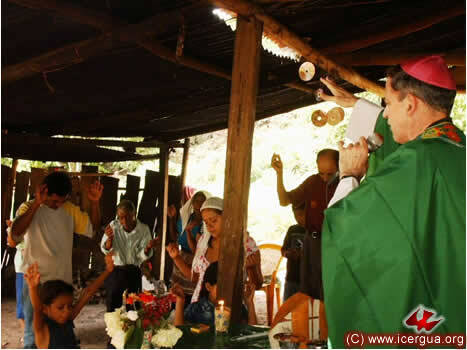 On Sunday morning, June 20, Monsignor Eduardo made a visit to the San Pablo Sibilá Community on the summit of the Cuchumatanes, in the jurisdiction of Chiantla, Huehuetenango. 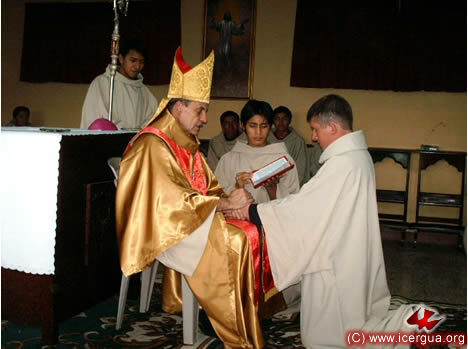 It was the first time that the bishop visited this community, which has existed for several years. The small and simple oratory was packed with parishioners. 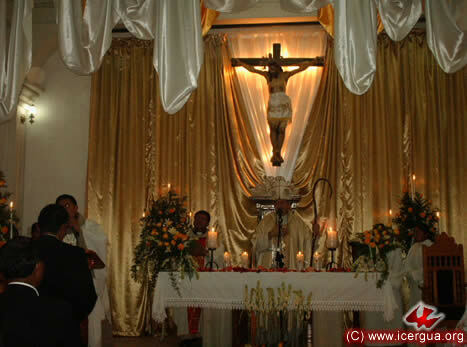 The presence of the Most Holy Sacrament was installed that day in the oratory. Its efficacy depends on the installation of the Communion Minister, who, after careful instruction, will be installed at the next Assembly, which will take place at the end of August in the Education Center. For the moment, neighboring Communion Ministers are performing this ministry in the community. 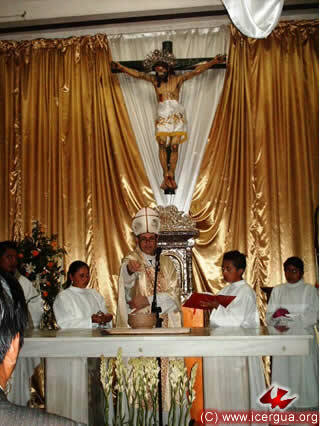 Above: The homily given by Monsignor Eduardo. Right: The distribution of communion. The church is small, and the faithful were so many that the bishop had to go out to those who would receive communion, all the way to the back of the church. JUNE 20. CELEBRATION WITH THE BRASILIA COMMUNITY, HUEHUETENANGO. 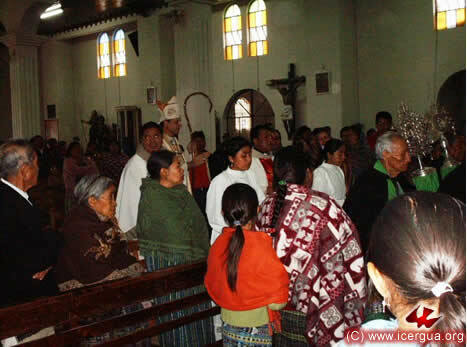 At midday the bishop presided at the Eucharist with the Brasilia Community in Zone 7 of Huehuetenango. On the occasion, the baptism of a little girl took place. The Brasilia Community has experienced genuine growth. From the first time that the bishop celebrated Eucharist, three families have joined the church. In addition the piety and commitment with which the faithful are living their there is remarkable. The coordinator is Brother Maynor, who is doing beautiful work. Above: The People of God coming forward to receive absolution after confessing their sins. Right: The People listening attentively to the homily. In the back at the right of the bishop is Brother Maynor, coordinator responsible for the community. JUNE 21. 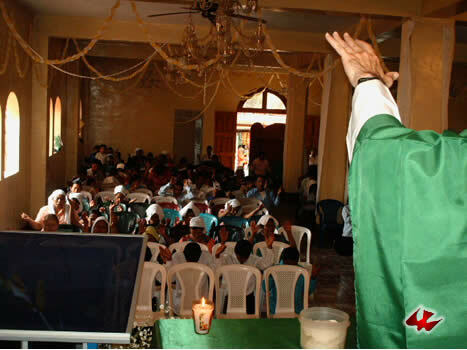 EUCHARIST IN THE HOME FOR YOUNG GIRLS AT LA CIÉNEGA, SAN RAYMUNDO, GUATEMALA. 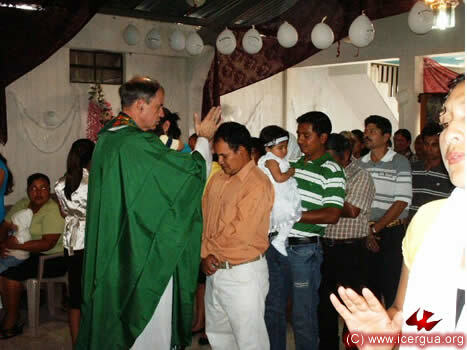 On Monday, June 21, the bishop celebrated Eucharist in the Home for Young Girls located in the María Auxiliadora Finca, La Ciénega, San Raymundo, Guatemala. Coordinated and financially supported by Sister Marifé Hellman, this home offers the opportunity for indigenous girls to pursue academic studies. A good percentage of them come from ICERGUA communities. In the photograph, one sees sisters who come from San Pedro Carchá and Chisec, Alta Verapaz, and from Chochal, Chiantla, Huehuetenango. They are setting the table, for after the Eucharist the bishop is to join them for refreshments. 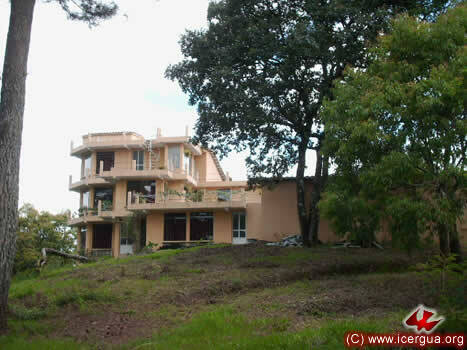 In the Finca María Auxiliadora is also located the see that the bishopric will occupy in the future, and which will serve as the bishop’s residence. Also a small museum will be located here, in which some of the special moments in the process of organizing ICERGUA will be documented. Above: The house, seen from a roofed area where two thousand people can gather for various possible events. Left: The little church, next to the episcopal residence. BEGINNING OF THE SECOND SEMESTER AT THE SEMINARY AND THE ESTYMLA. Although the first vacation will begin on July 2, the seminarians began the second semester on June 14. 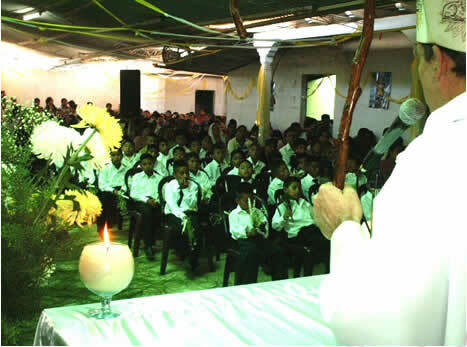 Father Juan Moisés Mendoza Sapalú was added to the team of tutors in place of Lic. Joaquín Gutiérrez, who because of scheduling problems could not continue to work with us. Since the first of the year, Father Juan Moisés has been participating in the academic program in other ways. 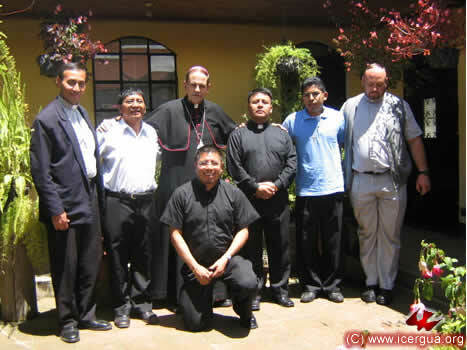 This additional assignment within the academic program as well as the bishop’s greater participation in it will help the seminarians to internalize more deeply the specific elements of our ecclesiastical identity, namely the rediscovery, the acceptance and implementation of all the characteristics that the church and its mission had in the first centuries of its history. Above: Our chapel. The Most Holy Sacrament has an important place in the formation process. In this way, the seminarians are urged to live in a constant attitude of listening to the Word of God and of prayer. In fact, every day the entire Holy Office is sung and the Divine Liturgy is celebrated. 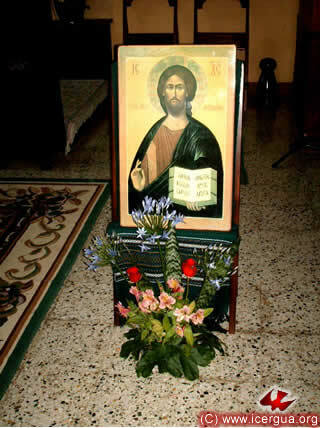 Right: The icon of Christ Pantocrator at the right of the altar. 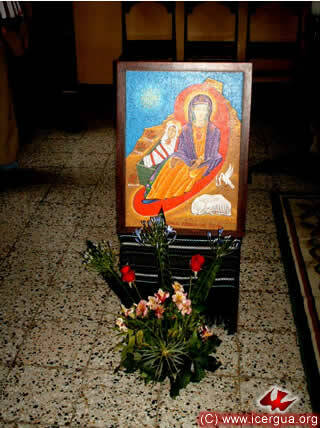 Left: At the left of the altar is the icon of the Mother of God and the Nativity. In the center of the chapel, above the altar, is the icon of the Crucifixion. The three icons are venerated by solemn incensing during the celebration of the Divine Liturgy. JUNE 24. 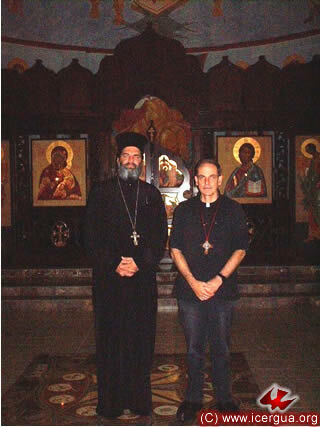 VISIT TO THE ORTHODOX MONASTERY OF AMATITLÁN. On Tuesday, June 22, by invitation of the Abbess of the Orthodox Convent of Amatitlán, Mother Inés Ayau, our bishop, along with Father Juan Moisés, visited the Convent to see the most recent stages of its iconographic decoration. It is a most beautiful work that is almost completed. The icons are Russian, and their style accordingly reflects the tradition of the Russian Orthodox Church. 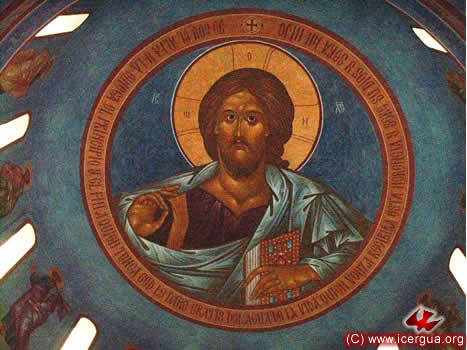 Above: The icon of Christ Pantocrator, which covers the entire interior of the dome. 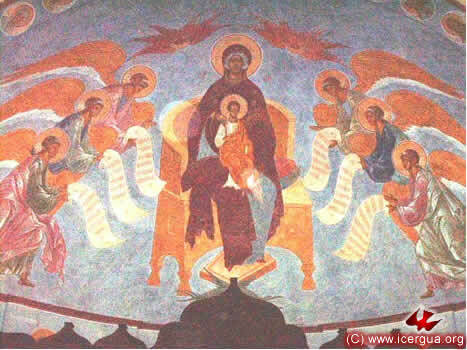 Right: The icon of the Mother of God, which is in the apse of the church. On the occasion of his visit to the Convent, Monsignor Eduardo took the opportunity to greet First Presbyter Jorge Farah, who was visiting Guatemala and is the Vicar for Central America of the Antioch Orthodox Catholic Archbishop of Mexico, to whom the Convent is assigned. JUNE 24. 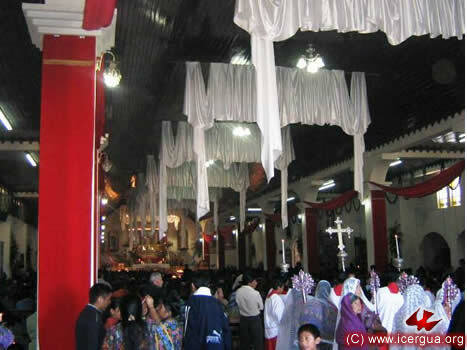 SOLEMN CELEBRATION IN THE SAN JUAN COMALAPA CATHEDRAL. 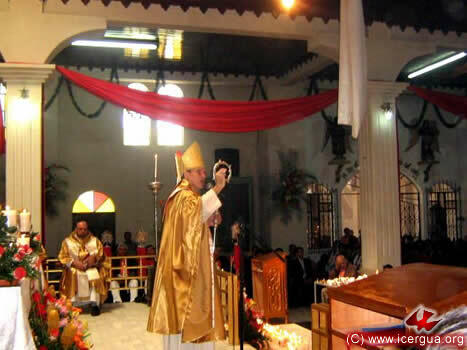 On Thursday, June 24, in the Cathedral of San Juan Comalapa the bishop presided at the Eucharist of its patron saint. It is a most beautiful liturgy. At least five thousand faithful were present. The church was ornamented with elegance, beauty and simplicity. The Liturgy had been splendidly prepared and was celebrated with great depth and solemnity. Above: The entrance procession is forming. As is its tradition, after the candle bearers and crucifer, the marshals and cofraternities enter in the procession, carrying the insignias of their responsibilities. Then come the Communion Ministers, the acolytes and finally the co-celebrants. Right: The homily. The readings as well as the homily were delivered in both Spanish and Kakchiquel, the native language of the parishioners. Left: The co-celebrants raise their hands while saying the Our Father. After the Mass, the solemn blessing for the float bearing the patron saint was pronounced. The float with its sculpted image was to be carried in procession throughout the town. At the Cathedral door, as can be seen in the photograph at the right, the bishop and the co-celebrants greet the People who were full of joy because of the celebration of St. John the Baptist, their patron saint. Since the consecration of the Sanctuary of the Most Holy Sacrament on June 3, it has become a center of prayer even more intensely than before. In the photograph can be seen the tabernacle filled with light, and, like the Holy Cathedral, splendidly adorned for the occasion. Left: After the meal, a photograph was taken of the presbyters attending with the bishop. 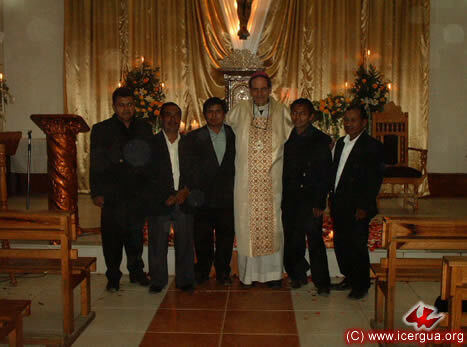 From left to right: Father Gildardo, Father Bernabé, Monsignor Eduardo, Padre Rigoberto, Deacon Denis and Father Herberth. In front: Father Francisco. JUNE 25. VISIT TO THE COMMUNITY "EFUSIÓN DEL ESPÍRITU SANTO" IN SANTIAGO, ATITLÁN, SOLOLÁ. 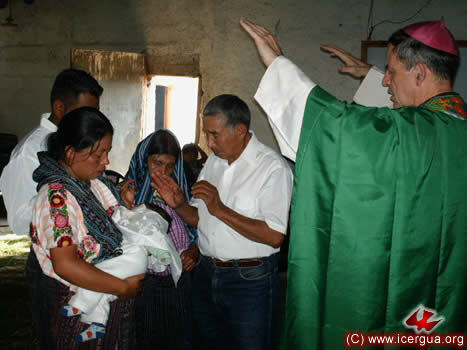 At the end of the afternoon on January 25, the bishop made a visit to the Community of the “Efusión del Espíritu Santo” in Santiago Atitlán. 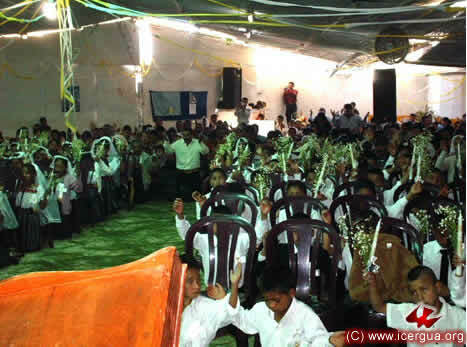 Among other things, the community was giving thanks to the Lord for the twenty-second anniversary of the time when its coordinator, brother Cruz Toj, received, in a supernatural form, the commission to evangelize the People of God. Left: The bishop addressing the Assembly during the Homily. Right: During the Eucharist, baptisms were also celebrated. 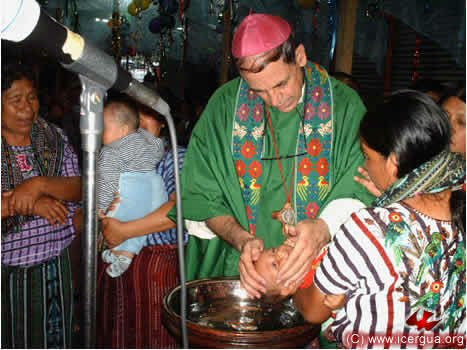 In the photograph, the bishop is pouring water and laying his hands on one of those being baptized. JUNE 25. VISIT TO THE PENTECOSTÉS COMMUNITY IN SANTIAGO ATITLÁN. 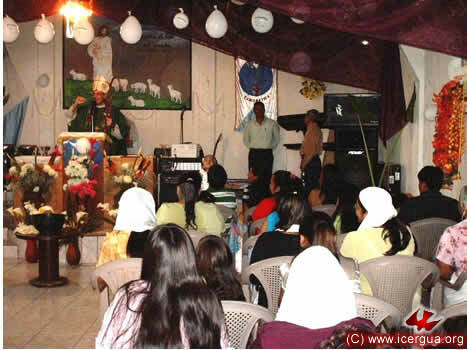 The bishop also celebrated Eucharist with the Pentecostés Community, Santiago Atitlán, on the afternoon of June 25. On that occasion the baptism of a child was celebrated, whose father is a member of the music ministry and his mother of the intercession ministry. Above: Prayer in preparation for the confession of sins that precedes the Absolution. Right: The baptism ceremony having been completed, the parents and sponsors pray over the child, asking for the Lord’s grace that the child may persevere in the faith. JUNE 26. 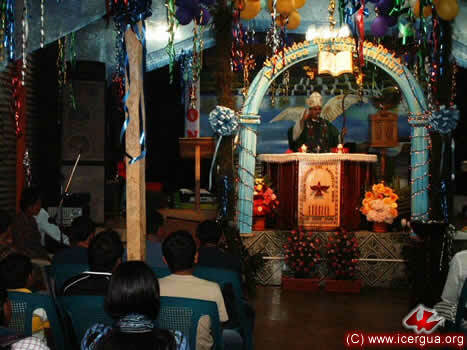 EUCHARIST WITH THE COMMUNITY OF LA LAGUNA, SAN PEDRO NECTA, HUEHUETENANGO. On Saturday morning, June 26, Monsignor Eduardo presided at the Eucharist with the Laguna Pajarito Community in San Pedro Necta, Huehuetenango. Fifteen children were baptized and seventeen did their solemn communion. JUNE 26. MEETING WITH THE COMMUNITY OF VUELTAMINA, LA DEMOCRACIA, HUEHUETENANGO. 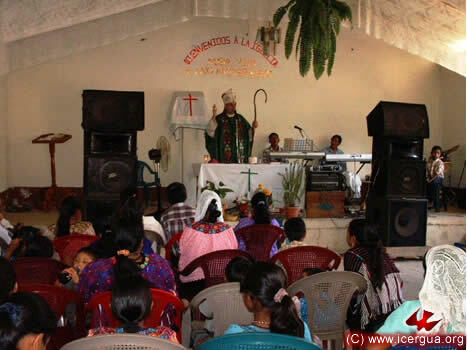 Around midday the bishop made his first visit to the fledgling community of Vueltamina in La Democracia, Huehuetenango. The community is comprised of five families, each with many members, who have just joined the church. All are deeply enthusiastic and committed to the faith and to working actively in our mission. One of their immediate goals is to construct a church building. 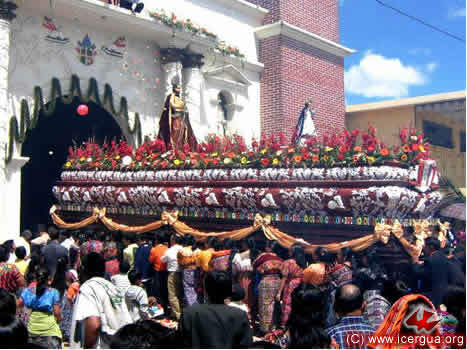 JUNE 26: CELEBRATION IN LA UNIÓN, LA MESILLA, HUEHUETENANGO. During the afternoon in a heavy rain, the bishop celebrated Eucharist with the community in La Mesilla, which is also new. This community began a few months ago. 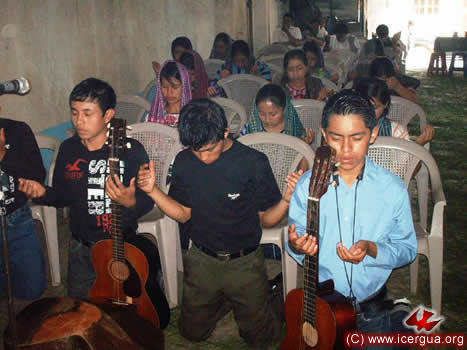 In spite of being composed of only seven families, which total 60 members, it has already succeeded in obtaining the land where it will construct a church building and has acquired the musical instruments needed for the music ministry. With faith and enthusiasm, they hope that soon the number of members in the community will multiply and that they will succeed in their projects. JUNE 27. 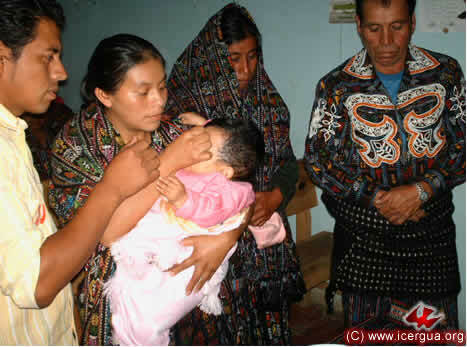 VISIT TO THE TECTITÁN COMMUNITY IN HUEHUETENANGO. had been addressed, note was taken of the importance of continuing to follow the mission that each had received, but with both sides refraining from making negative criticism against the other. JUNE 27. CELEBRATION IN CUILCO, HUEHUETENANGO. 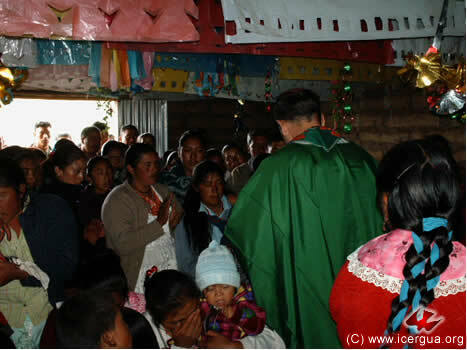 In the afternoon the bishop presided at the Eucharist in the Central Cuilco Community, which soon will be the seat of a new parish. As on every Sunday, the church was full of the faithful. During the celebration three young people received the complete rite of Christian Initiation (baptism, confirmation and communion). The three are brothers, who some time ago along with their father had converted, coming from an evangelical group. 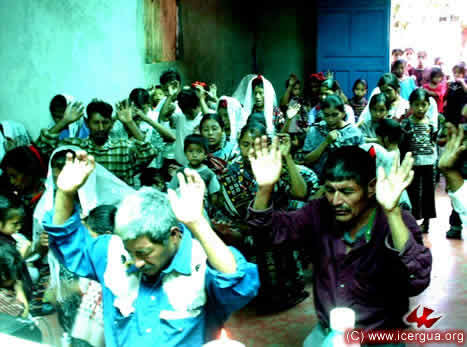 Above: The People of God praying prior to the confession of sins. 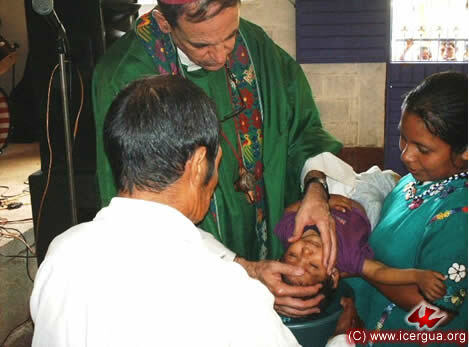 Right: Bernardo, one of the three young people, being baptized. During the Eucharist two Communion Ministers were installed, one to serve the Central Cuilco Community and the other to serve a community that has just made an alliance with us. JUNE 30. SUBDEACONAL ORDINATIONS AT THE SEMINARY. On Wednesday, in a solemn ceremony celebrated in the Seminary Chapel, four of our seminarian brothers, who at present are doing their supervised pastoral field work, received the order of sub-deacon. 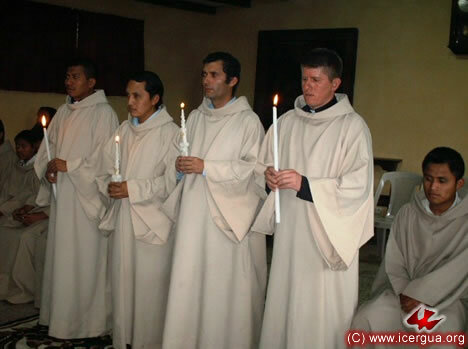 Within the ordination ritual, after being called, each one of the ordenands lit a tall Easter taper to indicate his readiness to consecrate himself totally to God, choosing to be perpetually and permanently united with our Communion of Santa María of the New Exodus, and accepting celibacy for the Kingdom of God as his state of life. 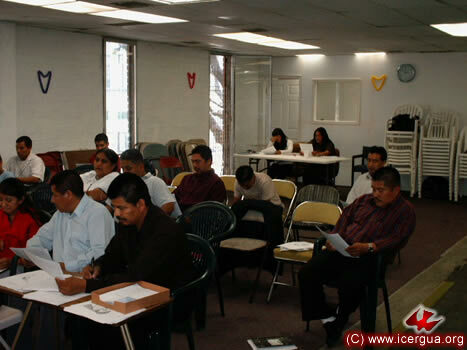 After the homily, which reminded them of the commitments and specific mission that inhere in the order that they were receiving, each of the candidates expressed his will to be united permanently and perpetually with the Communion and his decision also for perpetual celibacy for the Kingdom of God as his state of life. Above: Pedro Martínez making his promise. Pedro is at present doing his supervised field work (EPS) in the communities of Cuilco. With the help of the Lord he will receive the holy deaconate on July 11. Left: Esduardo Vásquez Coj making his promises. 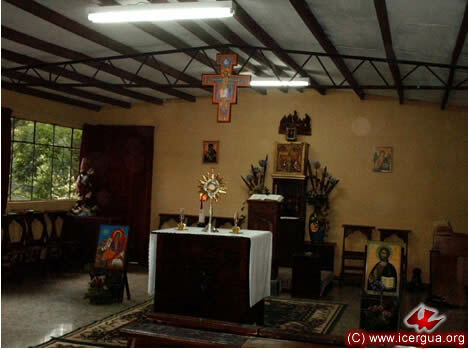 Esduardo is doing his EPS in the parish of San José Quixabaj, formed of the western villages of the municipality of Eulalia, Huehuetenango. José Armando Hernández expressing decision and commitment. José is doing his EPS with Father Hugo Patzán in the more than sixty communities of the Parish of Santa Cruz Barillas, Huehuetenango. Marco Tulio Calderón indicating his decision and making his commitment. Marco Tulio is doing his EPS with the communities of Nebaj and Chajul in the north of El Quiché. 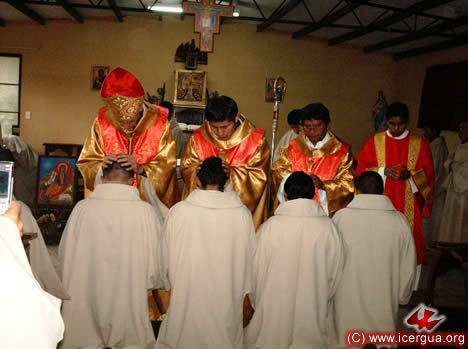 Right: After making their commitment of union and celibacy, the ordinands prostrate themselves while the whole People of God, on their knees, sing the litany. At the end, the bishop invokes the outpouring of the Holy Spirit upon those who are to be ordained. After the invocation of the Spirit, each of the ordained ministers present at the ceremony passes to pray above each of those who are receiving the holy order. Following that, the bishop makes a prayer asking for the outpouring of the Holy Spirit upon each of the ordinands. 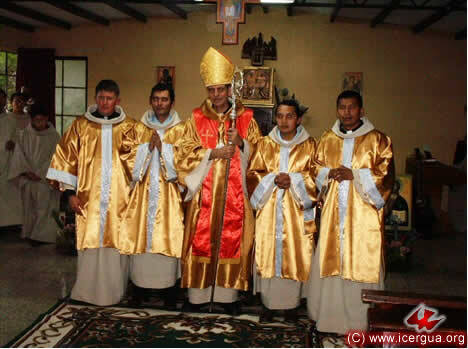 The vestments proper to the subdeaconate are the amice, the maniple, and the tunic. Before putting them on, however, the bishop consulted the People of God concerning the candidates’ suitability. On being asked, the People responded in each case, “worthy,” which cleared the way for the vestments to be put on. Right: The bishop delivering the book of the Epistles to one of the ordinands. He also delivered the empty chalice and the paten, symbolizing aspects of their work, and the deacon gave over the bottles and washbasin with water. The ceremony was characterized by peace, serenity and profound spirituality. It was truly an experience of the presence of the Lord. We now commend these brothers to all the People of God. 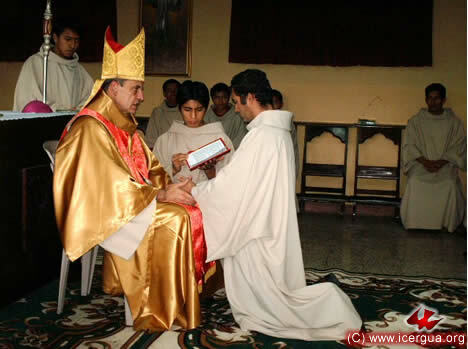 Having worked pastorally and ministerially for six months in one of the communities, having passed canonical examinations, and having received the formal request of the pastoral councils in the parish where they were working, they received this ordination. With the help of the Lord, they will very soon be ordained deacons and then presbyters in the service of God and His church.